The cross-sectional view of the n-channel depletion mode MOSFET fabricated on p-type substrate is shown in Figure. Figure also shows the corresponding electrical symbol of the device. The basic idea behind the operation of n-channel depletion mode MOSFET is to connect the n-type source and n-type drain diffusions by intentionally doped n region as shown in Figure as a n-channel. 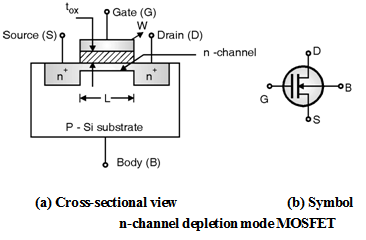 Hence in n-channel depletion mode MOSFET the n-type channel is already exists without the application of positive gate bias. Thus depletion mode MOSFETs are also called as "normally ON" devices and enhancement mode MOSFETs are also called as "Normally OFF" devices. Now, if a potential difference is applied between source and drain terminals then this would cause the electrons to flow from the source to the drain through the intentionally created n-channel and thus constitute the drain current.